The Ku Klux Klan is a white supremacy organization. The Ku Klux Klan started in Tennessee, following the American Civil War. In the 1920's it spread up into Canada. Klansmen came to Saskatchewan in late 1926 to spread their racial and religious hatred messages and to recruit more members. They sold expensive memberships to fund their activities. 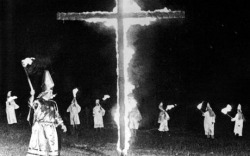 By 1928 Klans had been started in 100 Saskatchewan towns and burned crosses to show their presence. The Ku Klux Klan was big during the Great Depression. In the late 1930's to the early 1940's the Klan started to fall out. After the depression ended everyone wanted to get on with their lives and wasn't as involved with the Klan as they used to be. Today the Klan is less popular in Southern Saskatchewan than it was 70 years ago. There are still some Klan members in multi-race communities, such as Prince Albert where there are many first nations people. The Ku Klux Klan is important to the roots of our society because it's a part of history. The Ku Klux Klan may not have been an entirely good thing, but it helped shape us and our communities. There are still Klansmen today and without the KKK they wouldn't be a part of anything. The Ku Klux Klan was the second largest organization in Saskatchewan back in the 1920's. It was a huge part of Saskatchewan during the Great Depression. It brought people together. The Klan showed extreme racism against everyone who wasn't white, which in turn probably taught many to stand up for others and to love everyone for who they are. The Ku Klux Klan is a very creepy, scary organization. The Klan used to be huge and they would burn down crosses and have parades and meetings. I think they are interesting and wanted to find out more of what they did and why. They are a part of our history and we should know our history.